What is a Second Shooter and Do I Need One For My Wedding? What is a Second Shooter and Do You Need One? First off, what is a second shooter? Have you heard people talking about Second Shooters or have you read articles on Pinterest about having a Second Shooter and wondered, what the heck is that? Many of my couples ask me “Do I really need a second shooter?” The honest answer, it depends on what you’re looking for on your wedding day! 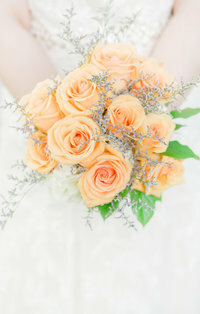 To start, A second shooter is another photographer, hired by your lead photographer, to help with the wedding day. The help ranges from taking pictures, to gathering family for family formals, and everything in between. There are many things to consider when deciding if you want to indulge in a second shooter; budget,quality of photos, perspective, and more. One of the main situations for which I recommended a second shooter is time. If you’re someone who wants to have photos of both the bride and groom getting ready, or multiple locations captured at once, then a second shooter is ideal for you as I cannot be in two places at once. This is especially true if you and your future spouse are getting ready at separate locations. 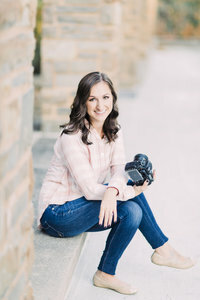 Having a second shooter is also great in situations where you might be exchanging gifts and letters on the wedding day and you want both the bride and groom’s reaction covered, or where you might want photos of cocktail hour while family formals are being taken. All of these moments are worth capturing but if they are happening simultaneously, then a second shooter is ideal for your wedding day. A second shooter isn’t just there to assist the lead shooter, they’re there to gain another perspective of all the special moments that are taking place on your wedding day. For example, during the first look, the lead photographer can focus on the groom’s reaction and the second photographer can focus on the bride’s reaction. During the ceremony, one photographer can focus on you walking down the aisle, the other can focus on the groom’s face. Having a second shooter allows for these other perspectives that you might not get with only one photographer. I can tell you firsthand that having a second shooter makes chaotic moments like family formals, go so. much. smoother. After the ceremony, it can be really tough to rangle up both sides of the family. It is nice to have an extra person that can make sure everyone is together and ready so that family formals take as little time as possible. After all, you want to try to enjoy SOME of cocktail hour, amiright? During moments like first looks, a second shooter can come in handy as well. Having an extra set of hands to put the groom in place, keep him company, and photograph him while the lead photographer is with the bride can save quite a bit of time! each wedding and each couple is unique. 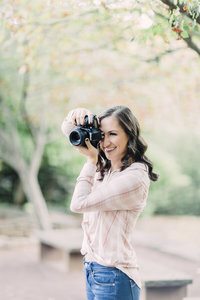 It is so important to talk to your photographer about what you envision for your wedding photos so that you know if a second shooter is something that would be appropriate for your wedding. Want to read a few more tips? Check out them out here!